Spicy green peas and onions with saffron rice and spiced chicken. Caution! Turn on your overhead fan if you have one, or open the windows before you begin! 1. Heat the oil in a large cast-iron or nonstick wok or skillet over medium-high heat and add the ginger, green chile peppers, and cumin seeds; they should sizzle upon contact with the hot oil. Quickly add the onion and cook until golden, about 5 minutes. 2. Add the coriander, ground cumin, cayenne, turmeric and salt, then mix in the peas and cook, stirring until all the juices evaporate and the spices cling to the peas (10 to 12 minutes). Mix in the mango powder and/or lemon juice. Sprinkle with garam masala just before serving. We never use mango powder, and I don’t think we’re missing anything by skipping that ingredient. When we made these the first time, we used 2 serrano peppers and the full cayenne portions. We really had no idea how spicy it was going to be. I may be part Thai, but I’m not a fan of hot foods. I can eat them like the best of them, but I’m not a fan. With two peppers and the cayenne, these were so spicy hot, they turned me off. JB loved them, though. The second time we made them, we emitted the serranos completely, and they were mild enough that our 1 year old ate them (and LOVED them). Pictured with Taste of India chicken rub and saffron rice. Mix it all up. We often serve it in the yogurt container. Goes well with crackers, chips, pretzels, vegies, and all things Indian. Chicken with asparagus, couscous and homemade raita. Total time: 2 minutes for the rub, plus cooking time. I like to use this one on chicken, but it can be used on tofu or pork, as well. 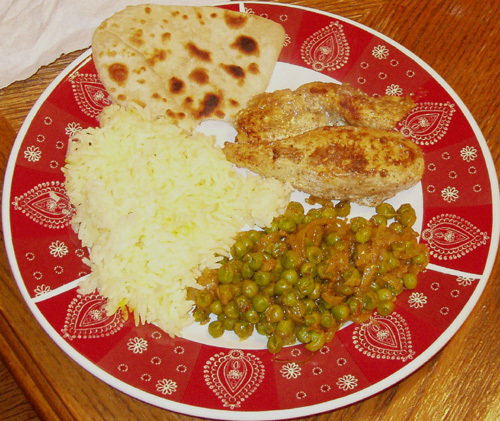 Chicken with saffron rice, spicy peas, and naan. Use the top five ingredients to make a rub, pan fry in oil of your choice. Or add the remaining ingredients for a marinade, and let set in the refrigerator 20 minutes to 24 hours. Above served with asparagus, couscous, and homemade raita. Below served with homemade saffron rice, spicy peas, and naan.